In a near perfect merging of polar opposites, video and statistics, Shutterstock, with data partner comScore and others, has created a video infographic called “Show Me Something” that highlights the exponential growth and engagement power of online video. Take a minute to watch the video; it’s a compelling story based mostly on comScore’s Video Metrix product and includes some eye-popping statistics on U.S. online video numbers for just the month of January of this year. Given that surge, it might come as no surprise that video ads are the fastest-growing segment of advertising on the Web. Video-ad spending doubled from 2011 to 2013 in the U.S. and is expected to grow 41% to $5.7 billion this year, according to the report, and $8 billion by 2016. That number is tempered considerably in the current Interactive Advertising Bureau (IAB) report that claims online video advertising hit only $2.8 billion in 2013 (versus the $4.1 billion in the Shutterstock video) – up only 19% compared with $2.3 billion in 2012. It’s still significant growth, with huge implications for the digital- advertising industry, and places video advertising as the fourth largest online advertising format behind mobile. In typical overstatement that now plays as conventional wisdom, it is speculated that many of those dollars will come from print media as well as online display, but TV budgets aren’t exempt and actually are the primary target. Both YouTube and Facebook are aggressively going after TV budgets, with Google seeking commitments in key content channels such as Beauty & Fashion, Comedy, Food and Drink, and Sports and Music, by offering audience guarantees and upfront buys – just like the TV networks. The pitch: TV ratings continue to decline and Web video reaches light TV viewers and cord cutters, most of whom are in the most desirable demographics. The 2nd annual “newfronts” presentations that are making the rounds now, just before May’s broadcast TV and cable annual upfront-negotiation extravaganzas for the coming fall season. A precursor to this was Google’s adaptation in November of a TV-like audience measurement that gives advertisers a way to make apples-to-apples comparisons with traditional TV. Through Nielsen or comScore tagging, advertisers can track things such as the number of people who see the ads and how often they are exposed. It also provides demographic data about who views the ads, which is how YouTube is offering guarantees. Regardless of which platform or channel it is viewed, the high consumer engagement of visual content has got marketers’ attention and investment. Along with the ad budget, they are committing TV-sized funds around production as well. To illustrate the viral nature of compelling video ad storytelling, the 10 most-shared ads of 2013 generated 28.8 million shares between them—a 52.1% increase from 2012 (19 million). For small businesses on limited budgets, quality production only enhances the great story that has to exist from the get-go, directed at the right audience. They can range from client testimonials, to behind-the-scenes sharing, or “How I got into ____” story. Check out these tips from onSMB and more tips from SmartShoot for great ways to incorporate video into your small-business marketing strategy. Returning to the Shutterstock video, you may be thinking, no way I’d dedicate 19 hours of my month (on average) to video! Most likely your children are carrying most of the weight on that statistic, but you are exposed to much more video than you likely are aware. No doubt, included in the count are the ones that play instantly, but are not really viewed or even seen. (eMarketer reports video ad completion rates of roughly 47% overall, so there still is much work to be done by brands and buyers to deliver relevant ads to engaged audiences.) Still, those are remarkable numbers. According to Citrix’s “A Day in the Life of a Modern Smartphone User,” infographic, which features lots of interesting mobile stats, 32% of social media is made up of videos. 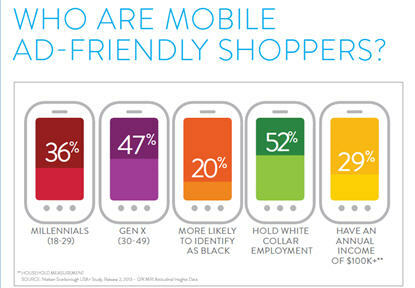 These statistics have inspired changes at both social and web portals. Facebook and Twitter purchased microvideo networks – Instagram and Vine, respectively – and are devoting more one-click video real estate right in the user feed. The portal sites are not standing idly by either. Yahoo is jockeying to come up with a YouTube competitor, and AOL just announced a comprehensive site make-over that positions it to become a video-ad powerhouse. Even the print and online news business is jumping into the fray; both the New York Times and Wall Street Journal are investing heavily in video content for their digital properties and will be presenting at NewFronts this year. The Seattle Times (where I am employed) is dabbling in providing video news content and currently offers pre-roll video advertising with an option to extend that reach through partner sites. The growth of online video viewing on mobile also deserves notice. According to Shutterstock/comScore, 8% of videos (1 in 12) were watched via mobile in 2012; in 2013 that frequency jumped to 1 in 6 (16%), and this trend isn’t showing any signs of slowing. The Citrix study, also done in January of this year, claims 20% of smartphone users use their phones to view video. Half of them are served display banner ads, which now account for 2% of mobile volume, but only one in 20 is served a video ad. While still in its infancy, marketers have high expectations for mobile and mobile outreach is being promoted as one of the most direct ways to reach target audiences. That said, most still aren’t seeing the kind value parity that would justify investment; it’s still just not as good in the minds of advertisers, according to Forrester Research, as the oft-maligned display advertising. In truth, most don’t have a mobile strategy, let alone one strictly for mobile video, yet no one thinks mobile advertising is going to get smaller over the next few years. For more stats on video viewing across devices, check out these highlights from the 2014 Experian Cross Device Video Analysis. 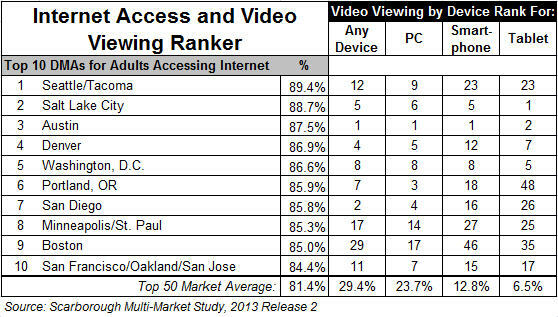 So how does all this video viewing play out in the Seattle market? According to the 2013 Nielsen Scarborough Research Report, the Seattle-Tacoma DMA market – 17 counties in Western Washington – outpaces the top-50 DMAs in the nation for technology ownership and is #1 for PC ownership. No wonder, then, that it also tops the nation for Internet access in the past month at 89%. As a tech-savvy market, one would think it would be a leader in video-viewing too, but it only ranks 12th – about even for the market’s size – for engaging with video content, with nearly 1.3M adults viewing each month, but much lower for doing so on a smartphone or tablet. The high use of PCs might have something more to do with so many in the market being employed in the software industry rather than device preference. They have ready access to viewing from both work and home, therefore making it unnecessary to waste battery power viewing on their mobile devices. 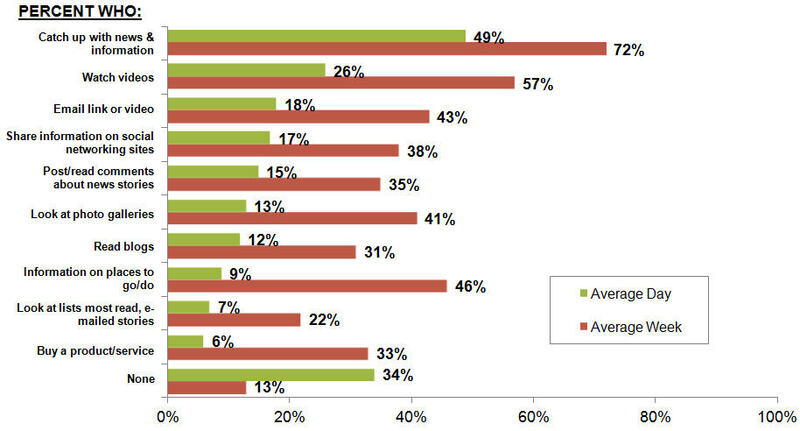 These findings tend to match the video ad-spending trends in the marketplace. 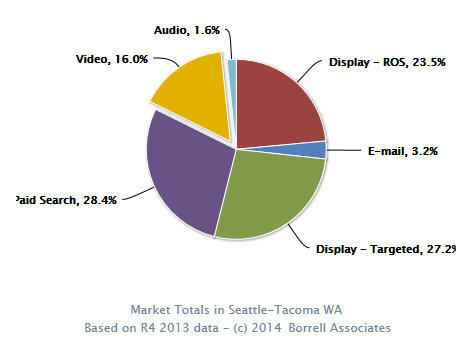 According to Borrell Associates, advertisers from inside the Seattle-Tacoma DMA spent 16% of their online budgets on video ads in 2013. 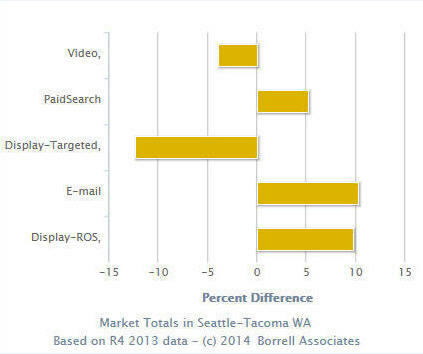 As the graphic below shows, the Seattle market is behind on investment in video, spending nearly 4% less than is typically allocated nationally, and relying more on email and display ROS. 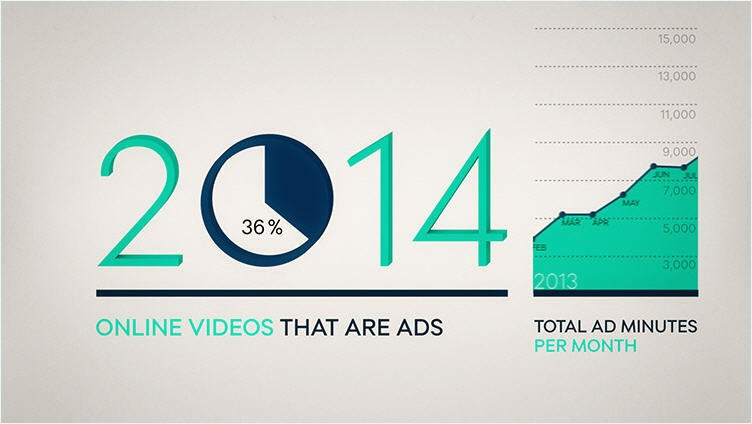 Video spending was $64,170,000 in 2013; that amount is expected to increase 125% by 2018, hitting $144.6 million. In a March 2014 survey conducted by American Opinion Research (AOR) on behalf of The Seattle Times, 87% of local online users access the Internet during the average week and 66% daily. The study concluded that catching up with news and information is the primary reason for going online in this market, with watching videos a strong (and growing) second and emailing a link or video third. Coming in at the 6th position is viewing photo galleries, which almost always is preceded by a video ad. That pretty much reflects the national trends. If nothing else is apparent from the rapidly evolving world of visual and video engagement, it is abundantly clear that traditional marketing efforts are not enough to stay competitive. Marketing no longer is something you push at a customer; it’s something you do with them and that requires putting yourself in their shoes. Video will certainly help you connect at that level. So much is happening in the video realm right now, it is difficult to keep pace with all the changes and announcements. In researching this post, I was taken in a new direction daily, if not hourly(!) and I expect even more news will transpire before I publish it. Not every platform or option will be right, but spending the time to find the visual angle to your business’ story and experimenting with different content formats not only will add spark to an already strong marketing strategy, but will boost awareness, engagement and, potentially, conversions. Video is an easy route to creating buzz and the right campaign integrated into your other marketing efforts can quickly generate referrals, friends, fans and followers. How about you? Is video advertising in your future? What questions do you need answered to become a believer? Are you already a superstar at video promotion? Share your successes in the comments section below!